Today I’m super-excited to participating in another Silhouette Challenge! So after you’ve checked out my spring-inspired project, please go check out all the other incredible projects that my bloggy buddies have created to get you excited and inspired for this fresh new season! One of my favorite things about Spring is planting my garden. It’s like Spring’s version of Christmas Day… heading to the nursery, picking out all kinds of colorful blooms and filling up every pot and bed in our yard. 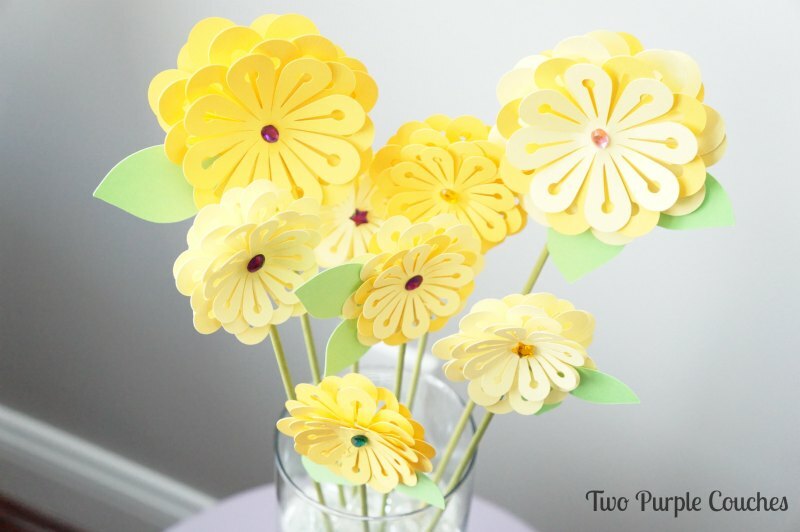 Since it’s still just a bit early here in Ohio, and the temperatures still a tad unpredictable, to plant our garden, I created a sunny paper bouquet to tide me over until I can head out to my favorite nursery! When I came across this 3D flower design in the Silhouette store, my wheels started turning. At first, I wanted to create some sort of 3D artwork, but after finding some superskinny 1/8″ dowel rods at the craft store, I wanted to try a bouquet. This was definitely the most involved project I’ve tried yet with my Silhouette Cameo, and most of the work was really in the assembly. 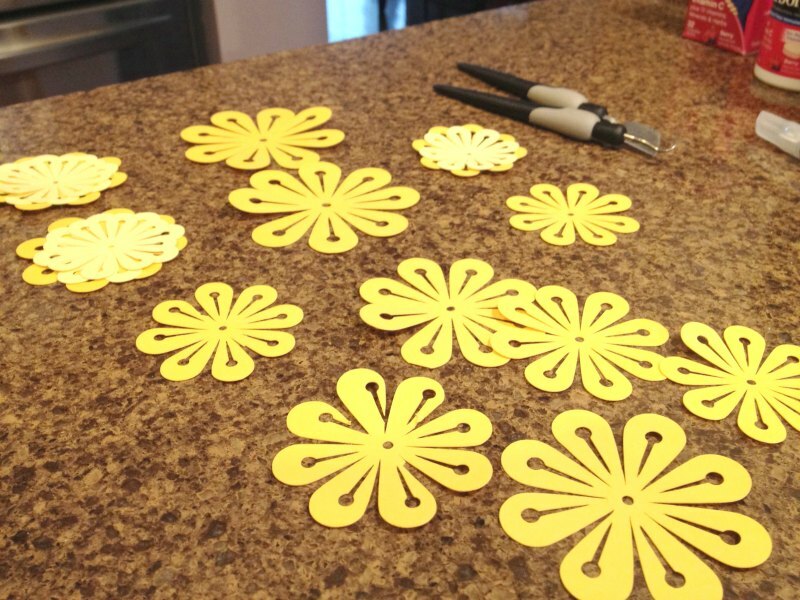 Except for the half of a sheet of petals that got messed up when my cutting mat inexplicably went askew while cutting. I swear, my machine is like a toddler… when I’m watching it, it’s fine. But as soon as I step out of the room, the mischief begins. Anyways, here’s how I put my paper bouquet together: I started by cutting out what felt like a bajillion layers of flower petals, but, in reality, was about 3-sheets-of-card-stock worth. 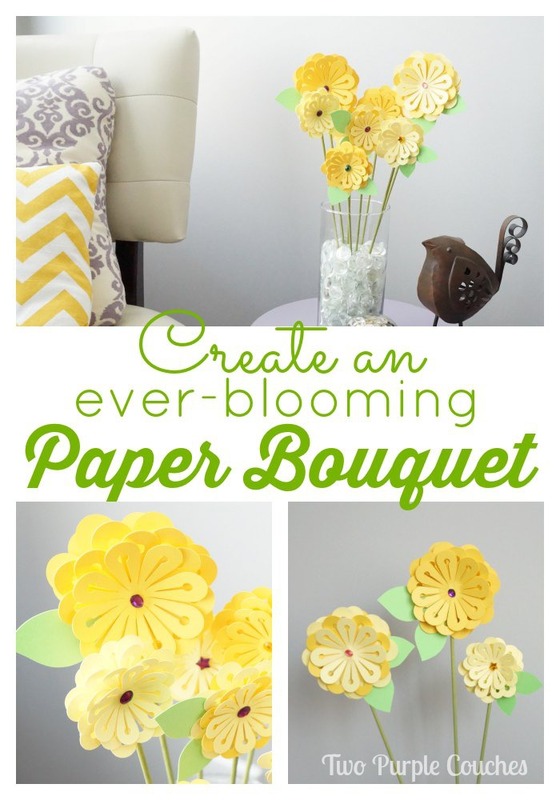 I used two different shades of yellow card stock so I’d have some variety in my blooms. I also enlarged the original template for some of the sets so I’d have a variety of sizes as well. As the flowers were cutting away, I painted the dowel rods with some green acrylic paint I had on hand. Then I started the tedious task of weeding out all my petals, matching up layers, and Mod-Podging them together. You’re essentially creating a flower-and-dowel-rod sandwich: place a dowel rod at the center back of one full flower. 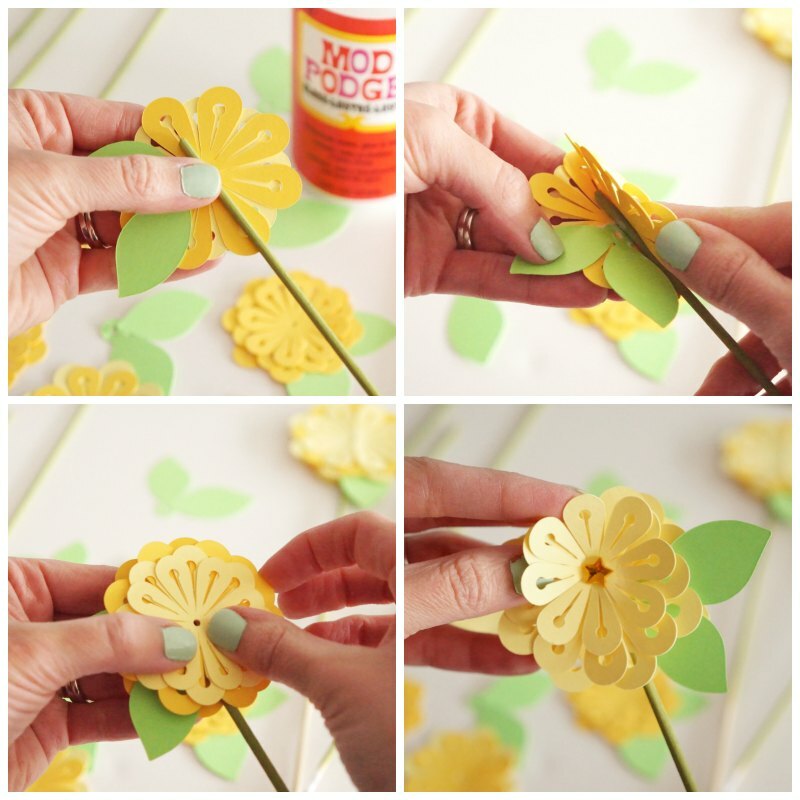 Dab some Mod Podge on either side of it, then add the second full bloom back-to-back over top. You can also add a leaf for some extra color and flair. Once each stem is created, you can add a gem or other accent to the center and then “fluff” up the layers of petals by gently folding them toward the center. Now grab a vase and start styling your bouquet! I think this would make a lovely, cheerful centerpiece for any Springtime event, from an Easter dinner to a baby or bridal shower to a Mother’s Day brunch! Remember how I mentioned that there was plenty more Spring inspiration to be had? Well, here it is! 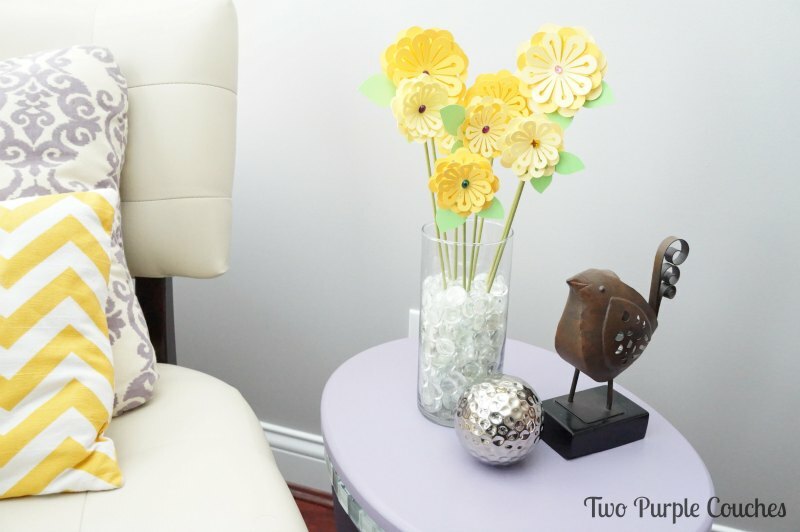 This entry was posted in Made It Myself on April 14, 2014 by Two Purple Couches. This bouquet would cheer up anyone! Thanks for sharing! I think I’ll be making loads of paper flowers next winter to keep my spirits up! This bouquet is such a fresh burst of spring! I love it! And you had me chuckling with your comparison of your machine to a toddler. That’s SO true of mine, too! They’re not to be trusted on their own, that’s for sure. Glad you persevered because this really turned out fabulously, friend! Haha, no they are not!! I think I’m starting to pick up on its tricks 😉 Thank you Lauren! Gorgeous! Love that it accents your chevron throw pillow! You are so well coordinated! Thank you Kate! I’m heading over right now to check out yours! Love the ever blooming bouquet! I’m particularly enamored with the yellow paper you chose and those gorgeous gems in the center. Plus, what a creative idea to use the dowels as your stems! One thing I have a love hate relationship with on challenge day – I want to make all the things! Thank you so much Kristy! I know the feeling of your love-hate relationship — I get more excited & inspired with each project I see! These flowers are so happy and scream spring! We both did flowers for this month’s challenge and next month’s challenge theme is floral! Can’t wait to see what you do for that one! So glad I popped on over on ‘Share it Sunday’ to see these amazing flowers. I am a bit of a paper junkie so these are right up my alley. Lovely and so spring time. Your choice of yellow paper is just perfect. Barb recently posted…What’s inside Your envelope? Your flowers are such the breath of spring I need after an awful winter! 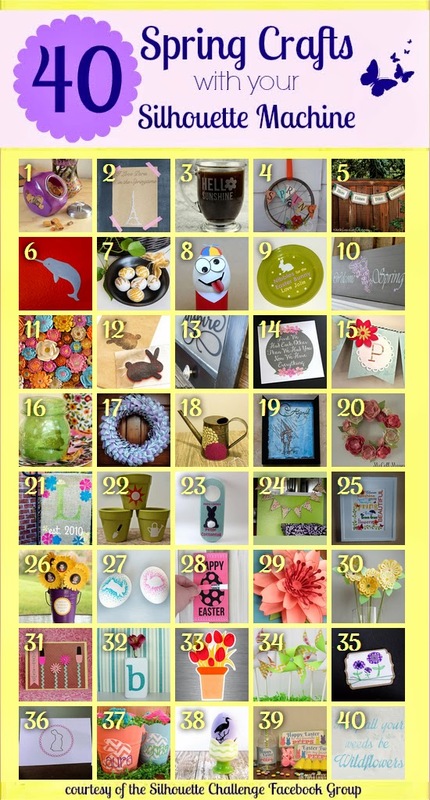 I can totally see making your flowers and using them to gift wrap a package too. So pretty! Thanks Michele! I have been craving signs of Spring for a while, too! Glad winter’s finally making its way out! I am MEGA late, but I looooove this!!! 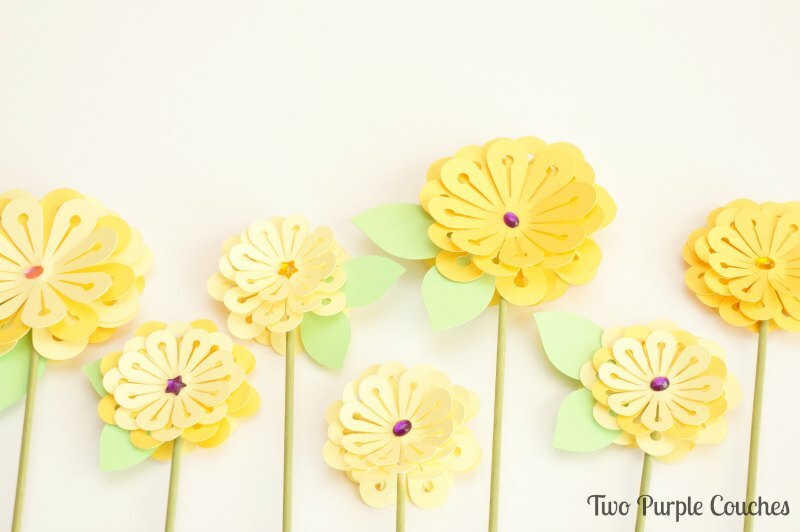 Super cute bouquet and such a great idea to use as party decor… I was envisioning flower stir sticks for the summer time! Great job, lady! You are rocking this Silhouette!!! These flowers make me smile Emily! There’s something about the yellow color I think. Thanks, Kelly! Yellow is just one of those always-cheerful colors!